Sandy Cotton knows North Texas well, having lived here 30 years. She’s known for getting it done, which clients appreciate when it comes to buying or selling a property. Sandy uses her impressive listening skills to determine exactly what clients are looking for in a new home. She helps sellers by reminding them of their goals, such as to downsize so they can have a better retirement or to move into a certain school district for their children. Selling a property can be emotionally trying, and Sandy points clients to the new memories they will make in their new home. When you’re ready to buy or sell a property, call the agent who makes things happen. Call Sandy to make the process smooth and timely. You’ll be glad you did. Southlake, Colleyville, Westlake, Keller, Grapevine, Trophy Club. Properties at all price points. 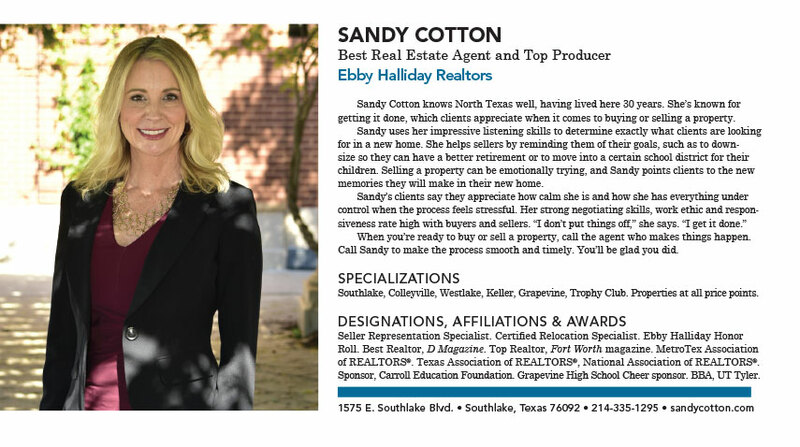 Top Realtor, Fort Worth magazine. Texas Association of REALTORS®, National Association of REALTORS®. Grapevine High School Cheer sponsor. BBA, UT Tyler.